On July 6, 2015, OhioHealth will open its doors to the new OhioHealth Neuroscience Center on Riverside Methodist Hospital's campus. The new $300 million center aims to create an exceptional experience that is currently unavailable anywhere in the region, and will give OhioHealth the platform to serve as one of the nation's leading neuroscience centers, especially since OhioHealth is already home to one of the nation's largest comprehensive neuroscience programs. The ten-story, 409,000 square foot tower is now the tallest building on the Riverside Methodist campus. The center boasts 224 private rooms, uniformly and uniquely designed to give neuroscience patients and their loved ones the privacy they need, all while improving the patient and family experience. Overall, the tower includes a garden level plus ten stories – seven of which are patient rooms with 32 rooms per floor – with offices, clinic space and procedure rooms on the first two floors. In the middle of the building, there is a large, open courtyard, which is viewable from interior patient rooms. "I've spent my entire career delivering care to neuroscience patients, but I never thought I'd see the day when there'd be an entire building dedicated to it," says Janet Bay, MD, system vice president and physician lead for OhioHealth Neuroscience. "So to see this as a reality is really thrilling." Neuroscience deals with the diagnosis and treatment of diseases of the nervous system, which includes the brain, the spinal cord, and the peripheral nerves. Patients with neurologic disorders face unique challenges, and therefore require unique care. Neuro patients face conditions including multiple sclerosis, epilepsy, strokes, Parkinson's disease, and Alzheimer's, and they can also experience brain tumors, aneurysms, hydrocephalus, and all kinds of common spinal conditions – all of which can be treated and cared for at the new center. Dr. Bay explains that the new tower is an all-encompassing, comprehensive neuroscience center where patients and their families can be taken care of from diagnosis to acute treatments to follow up. "There are interdisciplinary clinics where patients can be seen, there are imaging capabilities so they can have CT scans and MRIs. And they can even have brain wave testing if they need it." The center boasts eleven procedure rooms for neurosurgery and interventional endovascular care – everything needed to take care of the most complex neurological and neurosurgical conditions. It also has a dedicated suite for radiation treatments for neuroscience patients, allowing patients to have this additional treatment modality in the same tower as where they received their surgical care. "So really, we have comprehensive capabilities for caring for our patients," says Dr. Bay. The center is also about creating a better patient experience, which means expanding clinical capabilities with features that include neuro-specific operating rooms and infusion space for multiple sclerosis patients. "When you're looking to expand programs and services, you have to look at the staff to support those, and that means we've had to step up our recruitment of neurologists and neurosurgeons," says Bay. "In fact, we've added 24 physicians to our neurology and neurosurgery ranks since announcing the Neuroscience Center project, and many of them approached us about an interest in joining our program." "While our patients are here dealing with life changing neurological conditions and the 'tough stuff' that it brings to them, we hope it's a place of hope and healing. That they feel it's a place of inspiration. And when they leave here with those thoughts, we know we've done our job," says Connie Gallaher, MS, RN, system vice president, OhioHealth Neuroscience. "In the entire state of Ohio there's not any one center that serves both inpatient and outpatient neurologically-compromised patients under one roof," says Gallaher. "Our focus was, is and will always be on the patient and this was all created with the patient in mind." The center has simple, direct and wider hallways and doorways for easier access and navigation. There is also communication technology and sound absorption to reduce hospital noise. Each private patient room has a uniform design, so if the patient has to be moved, it minimizes confusion. Each room also has large windows allowing for natural light, and larger bathrooms for easier access. "We wanted to get all of our neuro and heart patients in one location and we wanted to move toward all private beds," says Brian Jepson, president, Riverside Methodist. "And we did this through excellent collaboration with our architects, physicians and staff." This is all about a comprehensive and collaborative approach for the patient facing neurological challenges and issues and their family and loved ones. OhioHealth treats more neuroscience patients than all other central Ohio health systems combined. In fact, Riverside Methodist treats the most stroke patients in the state. Additionally, the hospital was Ohio's first facility certified by The Joint Commission as a Comprehensive Stroke Center for its exceptional efforts to achieve better outcomes. 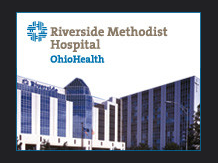 Riverside Methodist is also part of the OhioHealth Stroke Network, serving 20 hospital partners. "This was our chance to bring together the talent with the opportunity to do this, knowing that there was nothing like it in the state, or in the region." And bring together the talent, they did. Approximately 250 new jobs were created as part of this project, especially in the areas of clinical staff and diagnostic services, as well as support staff. "There's a tremendous amount of pride that all of us feel with this project," says Jepson.